Robert Hudson Leeds Ltd were established in 1865, their works the "Gildersome Foundry" was situated at Gildersome near Morley, Leeds. More convenient for clients the firm had their head offices at Meadow Lane just south of the city centre and close to the Hunslet and Holbeck areas where many of the engineering firms supplying factory machinery and railway equipment were situated. The Hudsons were a wealthy family with interests in the mining industry, supplying the mining industry would provide much of the work for Robert Hudson. The company specialised in providing light railway equipment such as prefabricated narrow gauge track sections and various designs of wagon. The company would also supply locomotives but these were almost entirely sub contracted to other companies that specialised in locomotive production. As well as supplying complete railway systems they supplied rope haulage systems. Like many firms in their early days they took whatever work they could get. An early advertisement shows an illustration of smiths forges they produced, quite a useful product as large industrial facilities would have done a lot of engineering work in house using forges like this. Early patents also included 'improvements to carding engines' for the textile industry. The works was situated alongside the Great Northern railway line, sidings were provided for receiving raw materials and dispatching completed products. In 1953 an incorrectly secured load on a train despatched from Gildersome caused a serious accident at Longniddry in which the fireman was killed and the driver and guard injured. The report in to this accident is available online and tells us a great deal about the workings of the dispatch sidings at Gildersome. One of the most successful Hudson products was the small tipper skip wagons the firm made from their early days. In 1875 Hudson patented the "rolling triple centre pivot" this provided three points at which the skip on the wagon could sit securely, in the centre for movement and tipped over 90 degrees to either side for unloading. Many thousand of these must have been made and can still be found all over the world. The design formed the basis of many products in their range under the Rugga brandname. As well as being useful to the mining industry Hudson's tipper wagons were employed in large numbers in quarries and clay pits. A key to the success of Hudsons wagons was their roller bearings that meant the wagons required minimal force to move them. Wagons could be pushed around by hand or very long trains could be pulled by a small locomotive or an animal. 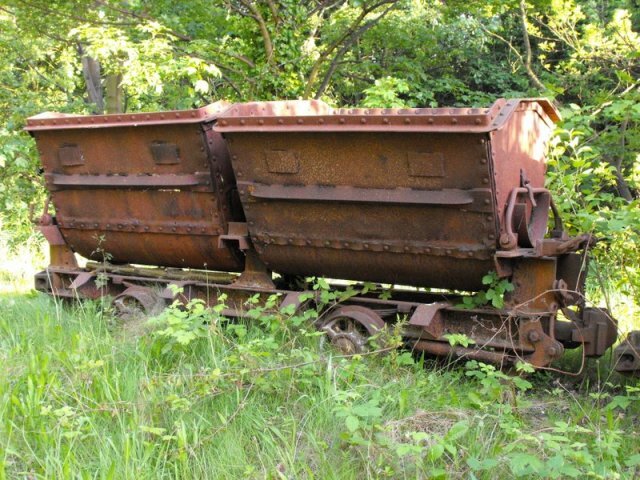 The tippers were made in all shapes and sizes, variations on a bogie chassis with two skips were made and sizes went up to standard gauge versions that were popular with colliery internal railway systems. 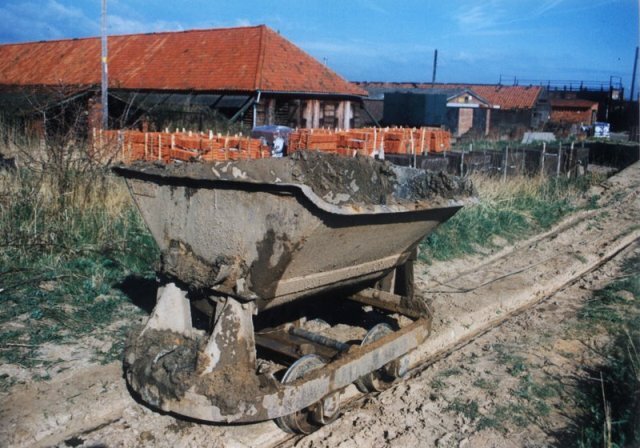 For the confines of mine tunnels a number of skip wagons were made where the skips were U shaped rather than V shaped to make the most of the limited space available. Wagons were also made for tipping by turning the wagon, chassis and all, upside down. This of course could be supplied wagons, tipper and track together. A varient of the standard gauge tippers was built with securing chains and extended sides to allow it to be used on the mainline railway network. 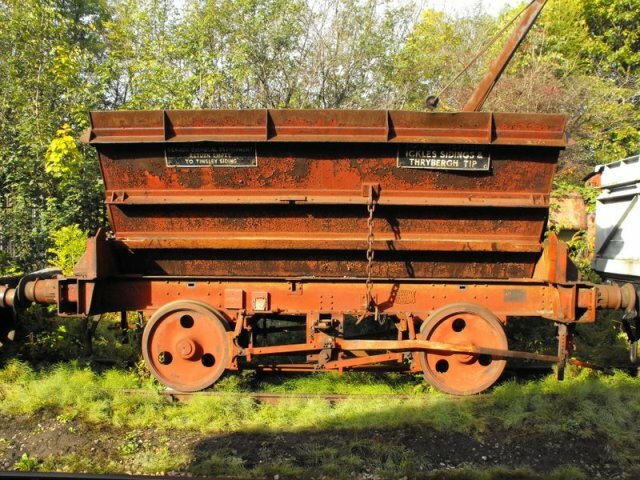 Below is a picture of one of these standard gauge tipper wagons preserved at the Middleton Railway, this was used for moving sewerage on the mainline system, this may explain why the railway company insisted they were modified to prevent spillages. This particular wagon was constructed by Charles Roberts of Wakefield, Hudson occasionally put work out to other manufacturers like this. 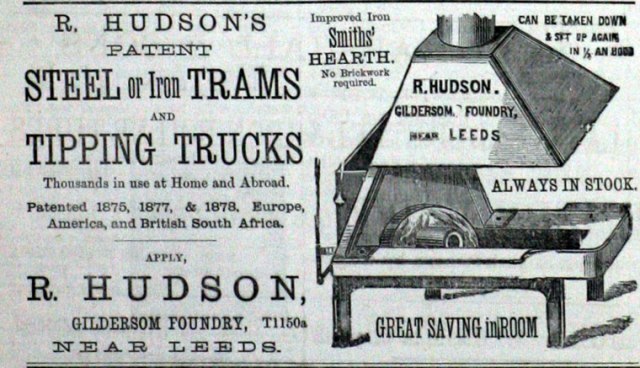 More elaborate tippers were produced under the Granby brandname. These were designed to tip automatically while the train was moving and were popular for moving ore from copper mines in Canada and South Africa. As well as the tippers, hopper wagons were produced. The company also produced a lot of narrow gauge equipment for sugar plantations too. Even goods vans, guards vans and passenger carriages were built. Look at the axle boxes on a narrow gauge vehicle any where in the world and there is a pretty good chaance you'll find the words "Hudson - Leeds"
With a lot of work supplying industrial railway systems to India and South Africa the company established works in Kidderpore in India and Durban in South Africa as well as proudly advertising that they had offices in "Johannesburg, Durban, Lourenco Marques, Beira, Bulawayo, Loanda, Salisbury, Lobito, Mauritius, Cairo and Singapore"
The company generally left the locomotive making to the experts. For a number of years they were supplying systems like their own where workers would shove single wagons around, for greater loads horses might be used, or even elephants as their adverts pointed out. The demand for locomotives increased with time and in 1908 they chose Hunslet Engine Co to supply locomotives to accompany a system being supplied to India. They also supplied a couple of Thomas Green locomotives around this time and subsequently carried an illustration of these in their 1910 catalogue. In 1911 they approached Hudswell Clarke to produce a range of locomotives to feature in the Hudson catalogue. A range of 16 designs were produced of various combinations of five sizes of cylinders, four wheels or six and 2ft or 2ft 6in gauge. The most successful of these designs was an 0-6-0 well tank which ended up being supplied in large numbers to the war department. Its low centre of gravity and light axle weight made it ideal for the supply lines laid across muddy battle fields. After the war many of these engines found their way in to industry and inspite of the large numbers of engines returned from the battle fields there were still some new additional orders for Hudson Hudswell locos for use in India. Above - Hudswell Clarke 1238, one of the War Department 060WT locos supplied by Hudson at the Apedale Valley Light Railway's 2014 Tracks to the Trenches gala. Hudson made very few locomotives themselves, they did make around thirty very basic small petrol powered locomotives based on one of their standard wagon chassis. Another Hudson attempt at locomotive building was the Hudson Fordson in the 1920s, this was pretty much just a Fordson tractor grafted on to a Gildersome made railway chassis. This was a bit more elaborate than their previous locomotives though, the chassis featured some quite chunky castings that must have provided plenty of weight to boost the traction and stability of the loco. The catalogue also offered a standard gauge version of the Hudson Fordson. When the contract with Hudswell Clarke ended in 1929 Hudson then turned to Kerr Stuart for the supply of steam and petrol locomotives. Six designs of different sizes made it in to the catalogue including their famous little 'Wren' design. The following year Kerr Stuart closed down though and the designs and goodwill of the firm were taken on by Hunslet Engine Co. In 1934 Avonside Engine Co also closed down (there was quite a downturn of the industry between the wars that also saw off a couple of local big names - Kitson and Manning Wardle) Hunslet again aquired the designs and goodwill. Inevitably Hunslet went on to supply locomotives for the Hudson range. In 1937 the famous 20hp emerged, the first of the line going to contractors building the Royal Ordnance Factory in Chorley and the remainder of the first batch for underground ammunition stores in Corsham. In the second world war large numbers of small four wheel diesel locomotives were supplied to the war department for use in munitions factories and supply lines. At the end of the war a large surplace of little engines was created and some sat in their crates in Hunslet's Quadrangle for many years. One order from Ireland needed to be completed quickly so a number of these Hudson Hunslets were refurbished and dispatched with new works plates. Three of these locomotives are seen below, now preserved at Drumod. 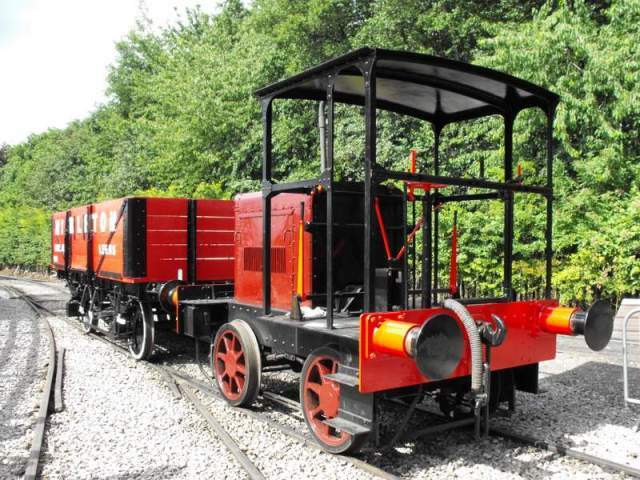 After the war this design of little loco, the 20hp, was given a face lift and emerged with the new name of the 21hp, a more modern look and a seat for the driver. These were popular with surface lines of mines (sub surface lines required more elaborate flameproof machines) and some have found their way in to preservation. The larger Hudson Hunslet locomotives were popular with overseas plantation railways, Hudson did much of their business supplying these plantation railways and the Gildersome works produced the wagons and track pannels so with the Hudson Hunslet locos they had a complete train set. 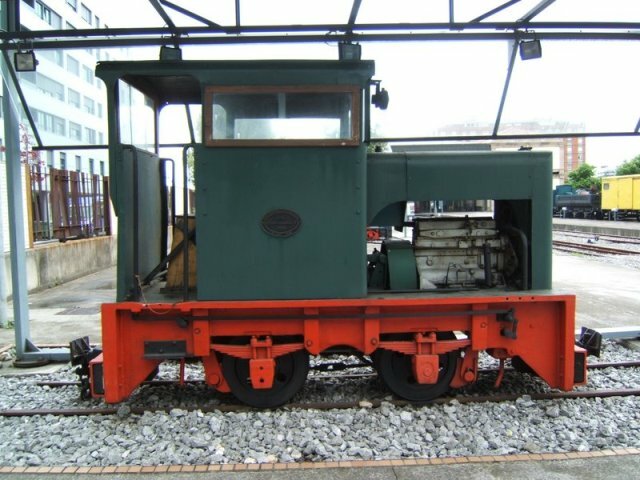 Below - Hunslet 4051 of 1948, one of the 'Estate Range' seen preserved in Oviedo Spain. 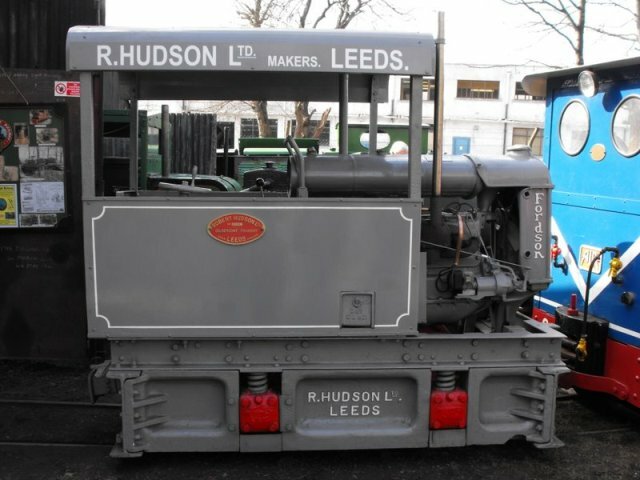 Hunslet's arrangements with Hudson saw practically all Hunslet's orders for the smaller locomotives (below 100 hp) handled through Robert Hudson and small Hunslet Narrow gauge locomotives will generally carry worksplates marked 'For Robert Hudson Ltd Leeds'. These Hudson plates can be found on the final industrial steam locomotive produced in Britain,"Trankil No4 built in 1971 to Kerr Stuart's Brazil class design and supplied to a sugarcane system in Java. The locomotive was still in use there in to the 1990s and has since been brought back to the UK for preservation at Statfold Barn. At the top end of the scale were standard gauge Hudson Hunslets, though only a few of these were produced. One of them, nicknamed Sweet Pea, was built for the Courage brewery and is now preserved at the Middleton Railway. It's a very basic loco with no cab, no horn (the crew have to carry a hunting horn) and a handle to start the engine. Hudson had one last go at in house locomotive production in 1968 with LX1001 and LX1002, the latter being preserved by the Moseley Railway Trust. 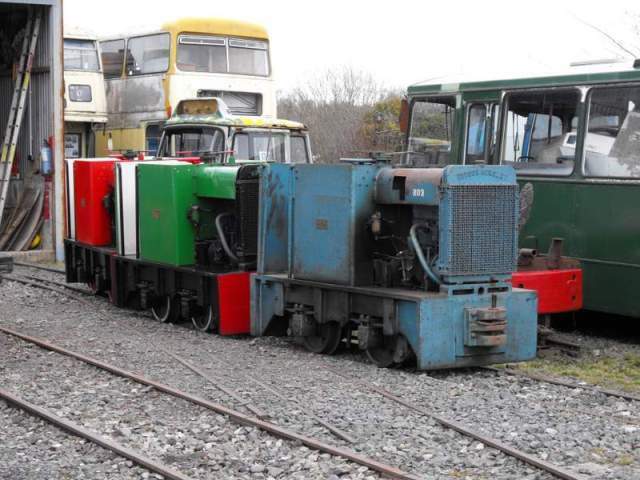 These locos were 4 wheel 2ft gauge diesel hydraulics powered by Gardner engines. As well as supplying complete railway systems for industrial conscerns and plantations a number of bigger projects were undertaken such as complete railways for Nepal and for Portuguese West Africa (now Angola), the latter project used 80,000 tonnes of steel to give you an idea of the scale of the project. In the 1950s and 60s railways were facing a downturn as road infastructure was greatly improved, to meet this change in the markets Robert Hudson began to produce road based construction equipment begining with the 'Leedsall' dump truck in 1960. By 1964 they had established a Construction Equipment division and were advertising concrete mixers, kiwi cranes, low loading trailers, tippers and water carriers. In 1968 this trade was supported by a show room on the nearby Wakefield to Bradford road. With the continuing downturn of its rail equipment devision and the Gildersome works now occupying prime development land alongside the M62 the firm moved to Mill Green in Holbeck (close to where Matthew Murray's first works had been). With the Gildersome works gone the construction equipment division effectively became an agent for Ford, Barford and Kubota equipment. The downsize didn't save Hudson and in 1984 the company went bankrupt. The designs and goodwill passed to Northern Engineering Industries and subsequently fellow Rolls Royce owned Clayton Equipment which now operates as an independant company and still produces Narrow Gauge railway equipment, much of which for export.